Learn about the giant clam. I especially want to put info about it here on my site, because of the huge pearls these things grow. 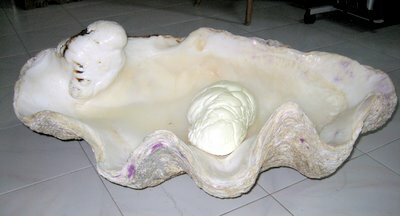 The largest pearl in the world is from this clam....it's time we learn more about it. Did you know that each one of these has unique colorings? Did you know that they never move from their resting place? Did you know they close slowly and are rarely dangerous to divers? Did you know their meat is eaten? I've seen lots of these monsters of the deep, but not live...I haven't conquered diving skills yet, but maybe someday. The shells make great conversation pieces, sinks, planters, etc. I've also seen smaller shells discarded along the wayside....a pity, because to most of us they are very special. See giant polish clam shells here. Enjoy this National Geographic video to find out if all the stories about this monster clam are true. A very large blister pearl.